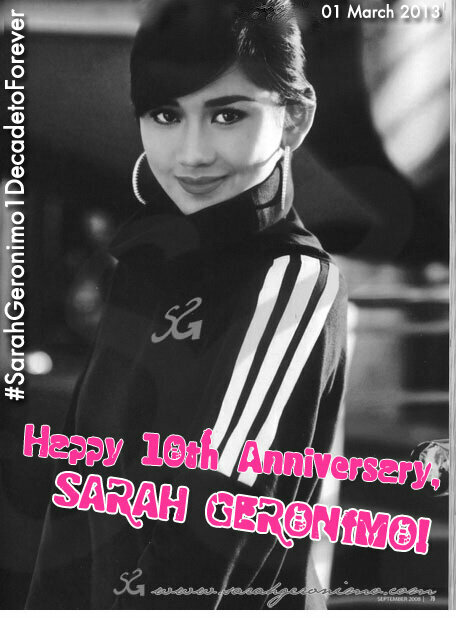 Happy 10th Anniversary, Sarah Geronimo! Cheers to more exciting and successful years that lie ahead. We love you always! May God continue to shower you with good health, happiness, more blessings, and grant all your heart's desires. We Love You Sarah, our Asia's Popstar Princess...we'll always be here for you. Take care always and God Bless! Happy 10th anniversary to our dear Sarah!!woot!! it's been ten years since this moment! Edited by FULGOR, 28 February 2013 - 09:20 PM. May you have more projects to come, good health always and happiness with ur family..and of course a true love in God's time(",)..
i won't let this day pass without logging in @ sg.com. Happy 10th Anniversary sa shubez Sarah!!! may you have more songs to sing, more grooves to dance, more characters to bring to life, more lives to touch, more people to inspire, and more happiness in everything you do. we are always here to support you... to love you... and to ride the waves with you. you've grown from an awkward teenager thrown into the spotlight, into a graceful lady who commands the stage. right before our eyes, you've blossomed, and we can't help but feel sentimental that through all the changes, your heart remains good and untainted by showbiz. you're a good person, in the truest sense of the word. God bless you and your family Sarah! we love you, and again, happy anniversary!! !